This past weekend on August 18th, the highly anticipated Air Jordan Golden Moments Pack was released. I was lucky enough to get them. Here's a teaser image to hold you down until I can take some detailed pics. Big shout out to SoleElite for helping me out with the size 12, really appreciate it. I highly recommend you all check out their site if you're looking for any new releases. As for the size 11, I was lucky enough to get an order through via FinishLine. So while it was looking like I might not be able to grab a set, I ended up with two! Now, I will definitely wear one and the other, keep DS of course! 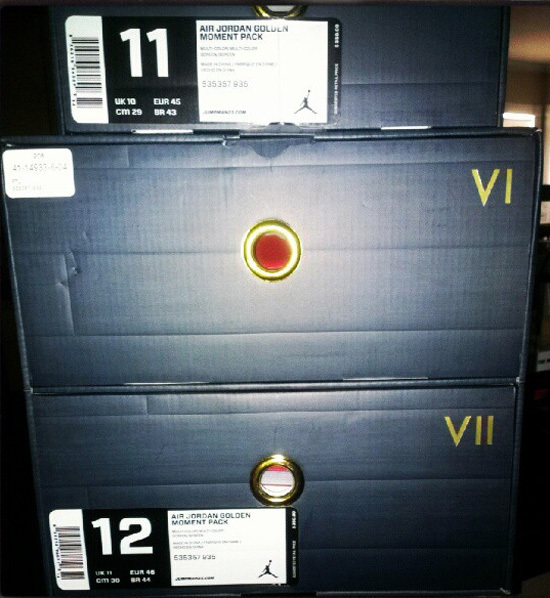 Did you get lucky and pick these up too or are you still looking for them? If so, you can check out InstyleShoes as they still have some available. Look for some detailed pics up shortly.